Xiaomi Mi 8 VS Vivo NEX S: which smartphone will you buy? 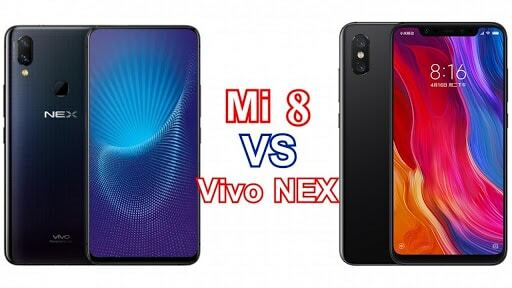 Home Comparison Xiaomi Mi 8 VS Vivo NEX S: which smartphone will you buy? Xiaomi Mi 8 VS Vivo NEX S: which smartphone will you buy? When it comes to innovations in the smartphone industry, China is currently leading the pack. Gone are the days when Chinese phone makers are only known for duplicate phones such as iPhone. They have now stepped out from the shadows and leading the way. OEM companies such as Xiaomi, Huawei, Honor, Oppo, Vivo, OnePlus e.t.c are now among the leading players in the industry. Xiaomi’s latest flagship; the Xiaomi Mi 8 is in high demand in China and globally. The smartphone got the highest score ever in AnTuTu Benchmark. Vivo is another Chinese phone maker making headway with their Vivo NEX S. The phone comes with no bezels and top-notch, instead, it features a one of a kind pop-up selfie camera. Between the Xiaomi Mi 8 and Vivo NEX S, which is really true innovation? And do they offer good quality-price ratio? All the answers you seek are in this article, just stay with me. The Xiaomi Mi 8’s design is pretty standard with a front and rear glass. The frame is made up of aluminum 7000 series, which is not found on your regular smartphone. The Vivo NEX S also features a front and glass back with aluminum frame. Guess we are all tired of seeing every flagship with that body build. The Vivo NEX S is slightly taller here but it’s much heavier and thicker than the Mi 8. In terms of weight and thickness, the Vivo NEX S weighs 199 grams with 8 mm thickness. Whereas, the Xiaomi Mi 8 weighs 175 grams with 7.6 mm thickness. The Xiaomi Mi 8 features a rear-mounted fingerprint sensor with a dual rear camera at the top left. The dual rear camera of the Vivo NEX S is also mounted at the top left corner. But its fingerprint sensor is on-screen, which is a feature most flagships are adopting. The bigger version of the Mi 8, the Xiaomi Mi 8 Explorer also features an on-screen fingerprint sensor. Both the Xiaomi Mi 8 and Vivo NEX S supports facial recognition technology. The display of the two smartphones is quite similar. The screen technology on both phones is the Super AMOLED panel. The panel measures 6.21 inch on the Xiaomi Mi 8. And measures 6.59 inch on the Vivo NEX S. The display of the Xiaomi Mi 8 packs an 18.7:9 aspect ratio, 1080 x 2248 pixels resolution and 402 PPI density. 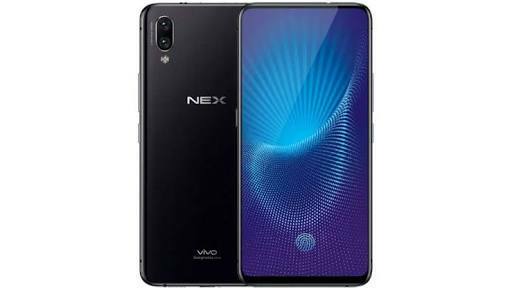 Whereas, the display of the Vivo NEX S packs a 19.3:9 aspect ratio, 1080 x 2316 pixels resolution and 388 PPI density. The Xiaomi Mi 8’s camera scored a total of 99 points at DxOMark ratings. And am pretty sure, the Vivo NEX S doesn’t won’t have such rating. The Vivo NEX S packs a dual 12MP & 5MP rear camera with dual-LED dual-tone flash. A f/1.8 aperture, dual-pixel PDAF, and 4-axis OIS are featured on the 12MP primary camera. While a f/2.4 aperture and depth sensor is featured on the 5MP secondary sensor. The highlight of the Vivo NEX S is in its front pop-up front camera, which features an 8MP sensor with f/2.0 aperture. On the Xiaomi Mi 8, is a dual rear camera consisting of dual 12MP sensors with dual-LED flash. The primary 12MP sensor comes with a f/1.8 aperture, 4-axis OIS, and dual-pixel PDAF. While the secondary 12MP sensor comes with a f/2.4 aperture. For selfies, the Mi 8 is equipped with a 20MP front-facing camera with f/2.0 aperture. The hardware department looks pretty standard like what you see in every other flagship. Both the Xiaomi Mi 8 and Vivo NEX S are being powered by Snapdragon 845 chipset and an Adreno 630 graphics processing unit for graphics. They both run on Android 8.1 Oreo with their respective company’s custom UI overlaid on it. The Xiaomi Mi 8 runs on MIUI 9.5 and the Vivo NEX S runs on Funtouch OS 4.0 UI. The Xiaomi Mi 8 comes with a 6GB memory and three storage options; 64/128/256GB. While the Vivo NEX S comes with an 8GB memory and two storage options; 128/256GB. The Vivo NEX S is equipped with a non-removable Li-lon 4000 mAh battery. Whereas, the Xiaomi Mi 8 comes with a non-removable Li-Po 3400 mAh battery. They also come with different versions of fast battery charging technology. The Vivo NEX S will cost you around $819 (N286,650) while the Xiaomi Mi 8 will cost about $515 (N180,250). The main difference between both smartphones is the camera, memory storage, and battery. The Xiaomi Mi 8 wins in the camera department. While the Vivo NEX S wins in the memory and battery department. Overall, the Vivo NEX S offers more but it isn’t worth the $304 (N106,400) difference in their price.